Florida Gov. 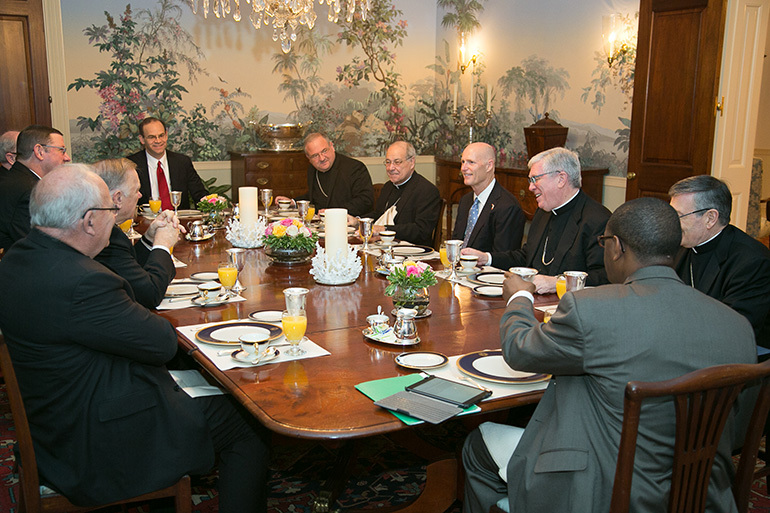 Rick Scott, center right, is shown here during March 2014 meeting with Florida's bishops. MIAMI | The Tallahassee-based Florida Catholic Conference turns 50 this year. That’s half a century of advocating for Catholic public policy positions in a rapidly changing state that is now the third most populous in the U.S. The Florida Catholic Conference is an agency of the Catholic bishops of Florida, established Feb. 1, 1969, by Miami’s first archbishop, Coleman F. Carroll, and four other Florida bishops serving at that time. The Conference speaks for the Church as a nonpartisan voice in matters of public policy and serves as liaison to the executive, legislative and judicial branches of government. The archbishop and bishops of the seven (arch)dioceses in Florida constitute its board of directors. The Conference works with the state and federal legislatures and administrative agencies, as well as non-Catholic groups. It speaks out on policy areas such as immigrants, housing, health care and criminal justice reform; educational matters involving parochial and public schools; right to life issues, including abortion, death penalty and euthanasia; and in matters affecting health, human sexuality, marriage and the family unit. File picture of the Florida Catholic Conference staff in 2011, when it was led by its second executive director, Michael McCarron, seated second from left in front. At far right, seated, is Thomas Horkan, the conference's first executive director. 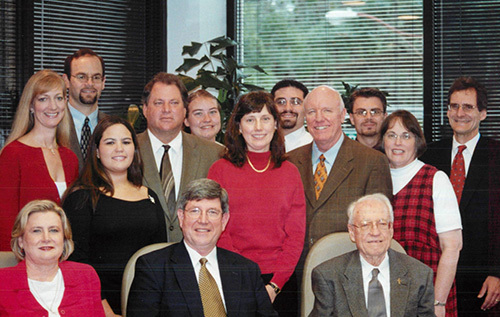 Current executive director Michael B. Sheedy is in the back, far left. The Conference’s third executive director since 2014, Michael B. Sheedy, who has been with the Conference since 2002, spoke with the Florida Catholic about the Conference anniversary and some of its activities. The interview has been edited for clarity and brevity. Q. The Conference hosts recurring events such as Catholic Days at the Capitol and the annual Red Mass of the Holy Spirit. Those are key events on our calendar every year here in Tallahassee. We are grateful that so many committed Catholics, especially from the councils of Catholic women and Knights of Columbus, and a growing number of young people, participate on a regular basis. We gather with our bishops and together respond to our call to be involved in the life of the world around us... It is always good to come together to both pray with and for elected and appointed officials in Florida, and to engage in productive dialogue to help Florida to thrive. We also have sponsored an annual statewide Respect Life Conference with respect life leaders from each diocese, which rotates across the state. These conferences engage the full culture of life. Content is broad, current and compelling. Q. What are some of the top public policy issues and concerns for Florida Catholics and our bishops in 2019 and beyond? We organize our work in terms of respect for life, education, health and social concerns. To enhance respect for life, there is a priority on limiting abortion and strengthening alternatives to abortion, and ending or limiting use of the death penalty. 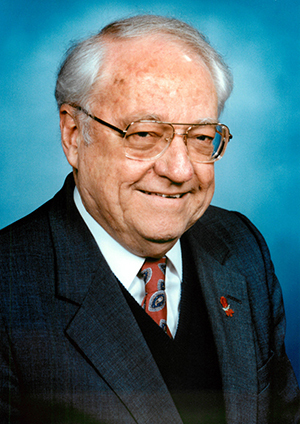 Thomas Horkan, Jr., was the Florida Catholic Conference's founding executive director, serving from 1969 to 1995, and then a decade more as its general counsel. He died in 2012. Education also remains a priority with a two-fold commitment to strengthening parental choice and to ensuring a strong system of public schools. Florida is among the leading states in terms of strong parental choice programs, and there are hopes to build on recent successes. We also seek strong accountability in our public and non-public schools, certification standards, background screens and professional development for teachers. Q. What are some of the public policy successes that the FCC helped to facilitate on behalf of the Church in Florida over the years? Despite challenges posed by previous Florida Supreme Court rulings on abortion cases, good pro-life laws have been passed and programs have been established. Florida has passed laws requiring parental notice of a minor’s abortion, prohibited public funding of most all abortions; offered services as alternatives to abortion through the Florida Pregnancy Care Network and Choose Life license plates. We passed a Women’s Right to Know (about abortion) Act, protections for infants born alive during abortion, and established crimes for harming pregnant women and their unborn children. With assistance from our courts, our death penalty mechanism has become more reasonable, requiring a unanimous jury recommendation for death sentences. Many Floridians have come to support ending use of the death penalty, especially when they recognize that the alternative is a life sentence without parole. Our tradition, noted especially by St. John Paul II, has encouraged us to work towards incremental improvements in the public arena when it is not possible to achieve the complete goal. This has been central in our advocacy around the death penalty. We have ensured solid end-of-life policies over the years, avoided problematic bills that put immigrants at risk and assisted their college attendance, expanded parental choice in education well beyond most every other state with the help of Catholic schools, and facilitated strong disaster response. Q. In what ways has Florida changed and grown over the last five to 10 years that might have gone unnoticed or unappreciated in general? 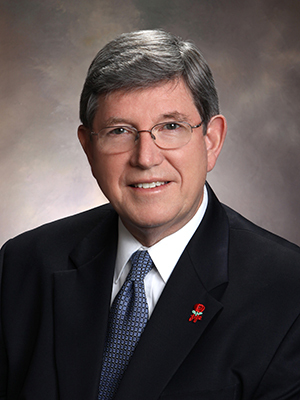 Michael McCarron served as the Florida Catholic Conference's second executive director, from 1995 to 2013. He joined the Conference in 1980 as its associate for education. Florida is now the third most populous state after California and Texas with 21 million residents. We are increasingly multicultural and multilingual and there are places you go where you might only hear Spanish spoken. It is notable that our growth is not just among Hispanics but is from across the United States and the world. At the state government level, we have the lowest level of per capita spending on state services. Things could be very challenging if or when we encounter a downturn in the economy; it could be hard for the state to provide needed infrastructure and services. Our tax base is low; this attracts people to our state, but it can make it difficult to provide the necessary services to residents. There are significant environmental concerns including red tide, algae blooms in our waterways and beaches, and Florida has been battling with Georgia over fresh water sources. These are among newer challenges. There are also concerns about rising sea levels along the coast. We respond to the call to responsible stewardship of creation. Q. Can you talk about the Conference relations with our new Florida Gov. Ron DeSantis? We anticipate a fruitful, productive relationship with the new governor. We have enjoyed strong relationships with some of his top staffers and are building on those as well, having met with his policy director and having communication with other key staffers. Gov. DeSantis has already done some positive, unexpected things that transcend partisan bounds and enhance the common good, such as calling for a strong response to environmental challenges confronting Florida and appointing members of the Democratic party to key positions. He has expressed a desire to expand scholarship programs for Florida school children. It is still early, but we are hopeful that there are going to be even more areas of common interest where we can work together to help Florida to flourish. Q. What are some other areas of concern that the Conference has ongoing engagement with? Ensuring access to healthcare for vulnerable persons and ensuring an ethical end-of-life policy framework are areas of strong interest. Women’s wellness, mental health, addiction and recovery are areas of serious attention in Florida. Assisted suicide is on the horizon and is being actively fought in other states. We are seeking comprehensive or at least multi-faceted immigration reform at the federal level, and strongly desire to keep the state out of what the courts have clearly recognized as within the federal government’s purview. And we are pushing for reasonable criminal justice reforms that treat offenders who are children like children, and broadly emphasize rehabilitation over retribution during incarceration. 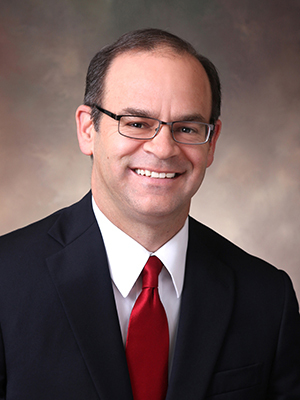 Michael B. Sheedy is the Florida Catholic Conference's third executive director, taking over in 2014. He has worked for the Conference since 2002, initially as its director of public policy. While much of the influence of the Conference over the years has been in the political arena, it also serves as the auspices through which the bishops can convene diocesan leaders to reflect on similar concerns — attorneys, communications directors, health ministry leaders, Catholic charities leaders, chancellors, child safety and protection of schools. In fact, as the bishops established the Florida Conference of Catholic Bishops in 2012 through which political activity flows, the most significant role of the Conference itself has been within the Church of Florida. In that respect, we operate an excellent, longstanding accreditation program for Catholic schools across Florida that has done a great deal to strengthen the high quality of our schools and served as a model for other states. It should also be noted that the Conference established the Emergency Management Services program to collaborate with charities agencies in responding to hurricanes and tragedies like mass shootings in both the short and long terms. Q. What about religious liberty? Florida law has strong precedent for recognizing religious beliefs and concerns of conscience in a range of areas including abortion, care at the end-of-life, family planning and executions. A lot of the conflicts that arise in the legislature and the broader culture are over how we understand the flourishing of the human person. Florida is wrestling at state and local levels with how to respond to issues of sexual orientation and gender dysphoria in employment and housing. The Church has a strong message of respect, charity and concern for individuals and families that is at times misunderstood... Indeed, despite claims of those with whom we differ on certain issues, there has been no greater force for good in society than organized religion with Judeo-Christian roots. Q. Can you talk about how modern communications, technology and the internet has enhanced the Conference mission? Things have changed in terms of how we interact with legislators. When I started working at the Conference, there were fewer lobbyists and it was easier to schedule time to discuss bills being debated in the coming week. We have also seen the implementation of term limits, which has the effect of more turnover among legislators. That has advantages and drawbacks, and has increased the influence and importance of lobbyists in the legislative process as there is less institutional memory among legislators. Now we transmit reports and alerts electronically through the Florida Catholic Advocacy Network (FLCAN). The bishops have directed us to work more closely with parishes to develop this network, and we are grateful to the many pastors who have already undertaken focused outreach to invite parishioners to join... This effort reflects the emphasis on utilizing technology to connect with people in productive ways to help them exercise their political responsibilities. First, for all the changes affecting the Church and society, the importance of relationships is as evident as ever. For the Conference, those are relationships within the Church and with elected and appointed officials. It is also increasingly relationships with members of our electronic network. Pope Francis has referred to the call to encuentro, and indeed, true encounters with one another, where there is an honest exchange, where trust and bonds are built, and God’s kingdom can emerge more fully in our midst. Second, there are tools that can help us to communicate, but they can also be used to sow dissension. Commitments to the truth, to charity, are key to the work of the Conference and are necessary to promote the good of our state and society in general. 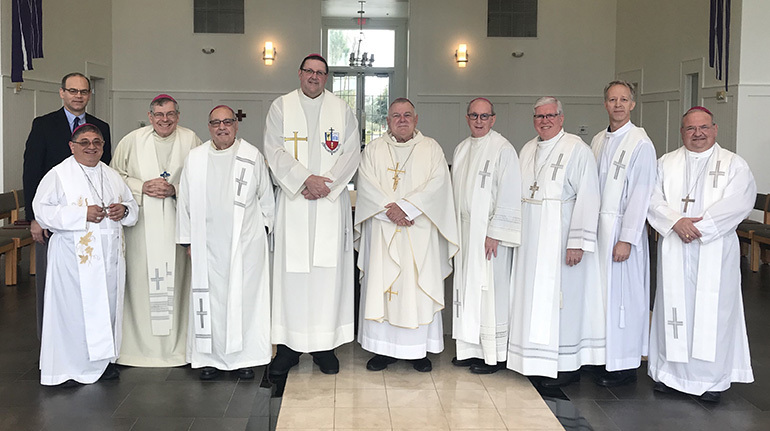 Michael B. Sheedy, executive director of the Florida Catholic Conference, poses with all the bishops of Florida after they celebrated Mass at their annual December gathering in 2018, at the Bethany Retreat Center near Tampa. From left: Sheedy, Miami Auxiliary Bishop Enrique Delgado, Palm Beach Bishop Gerald Barbarito, St. Augustine Bishop Felipe Estevez, St. Petersburg Bishop Gregory Parkes, Archbishop Thomas Wenski, Orlando Bishop John Noonan, Venice Bishop Frank Dewane, Pensacola-Tallahassee Bishop William Wack, and Miami Auxiliary Bishop Peter Baldacchino.